The next time you need to fix a hole in the wall, try out this surprisingly simple approach for remarkably fast, satisfying smooth results. Perhaps you swung the door open with a bit too much force. Or maybe the movers took a wrong turn with the dresser. Whatever its origins, there’s now a hole in your wall, and sooner or later it needs to be filled. Sure, you can always hire a pro, but why spend money on such a simple fix? Wall patching isn’t the hassle it used to be, at least not with HYDE Wet & Set. For holes or cracks in flat or curved surfaces—drywall, plaster, wood, or stucco—use the Wet & Set repair patch to achieve a quick and easy yet lasting result. Best of all, whereas wall repair used to take the whole weekend, including dry times, Wet & Set enables you to achieve same-day results. 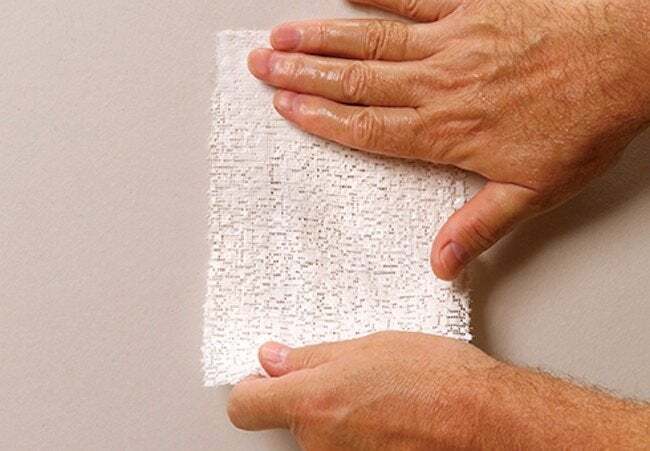 Available as a sheet for a single use or roll for multiple applications, Wet & Set looks and feels a little like fabric. In actuality, it’s a rather sophisticated material, imbued with both joint compound and specially formulated polymers. Wet the patch, and it fully activates, becoming a fast-setting, firmly adhering fix-all for dents, dings, and openings that are smaller than a baseball yet larger than a nail hole. Working with HYDE Wet & Set couldn’t be more simple. Here’s the process: Hold the patch over the problem area to determine how much of the material you’re going to need. From there, use an ordinary pair of scissors to cut the patch to the appropriate size. Next, dip the patch into any vessel of water, be it a bucket or a dishpan, and gently shake off the excess liquid. Last, place the patch over the damaged portion of the wall, using your fingers to smooth out the applied material. That’s it! The patch sets within 30 minutes, at which point you’re ready to do a skim coat of joint compound or spackle. Because the patch contains the initial layer of compound, you need to add only one more. Once it’s dry, proceed to sand down the protrusions, then prime and paint the patched area to match its surroundings. Nobody needs to know your wall or ceiling was ever anything less than perfect.